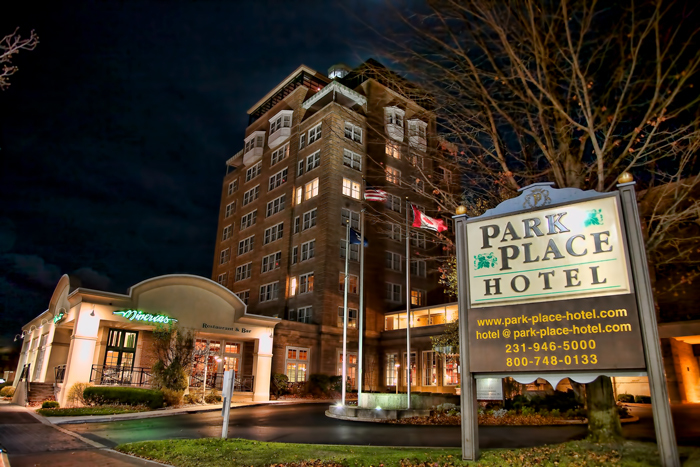 After Rose and I left Mackinac Island in October 2012, we stayed for one night at the Park Place Hotel in downtown Traverse City, Michigan. This hotel was constructed in the 1920s and opened around 1930 as a ten story hotel and has remained the tallest building in Traverse City ever since. The hotel was very nice and Rose and I both enjoyed our stay. There are several places to eat within the hotel and the views from the higher level floors are breathtaking if you are facing Grand Traverse Bay. 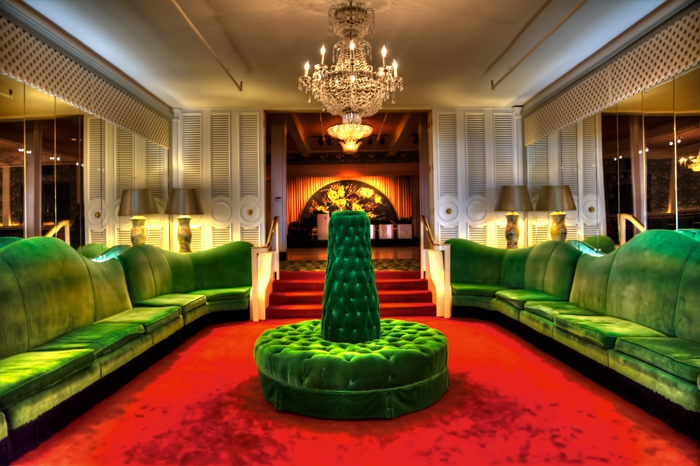 The hotel is also just one block from Front Street in downtown Traverse City as well as the Traverse City State Theater, a historic theater that was restored in the mid-2000s after sitting empty for more than a decade. Park Place Hotel, Traverse City by Joey B. Lax-Salinas is licensed under a Creative Commons Attribution-NonCommercial-NoDerivs 3.0 Unported License. Permissions beyond the scope of this license may be available at http://www.joeyblsphotography.com. 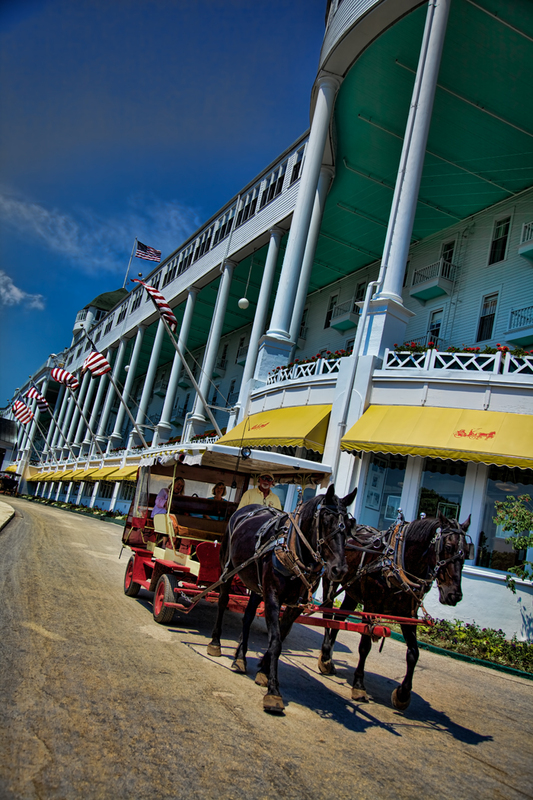 On October 26, 2012, Rose and I drove up to Mackinac Island to stay at the Grand Hotel and attend Somewhere in Time weekend, a weekend of events dedicated to the 1980 romantic film of the same name which was filmed on location at the Grand Hotel in 1979. 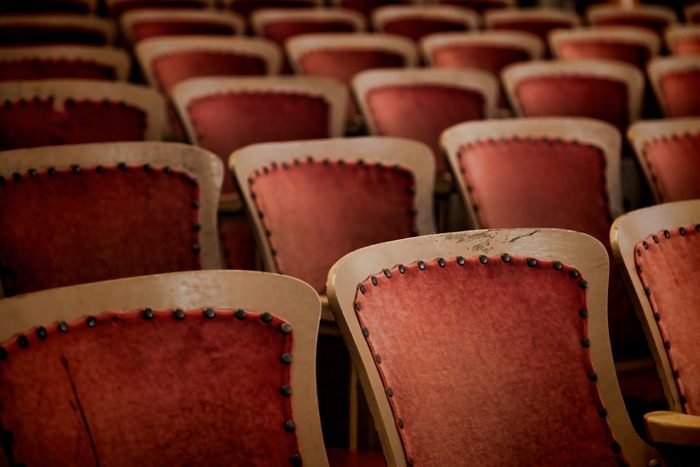 Fans from all over the country attend this annual event dressed in Edwardian era costumes and gowns, feathered hats and the whole works. The photo above is a picture of both me and Rose as we recreate one of the most famous scenes in the movie. The scene, known as the “is it you?” scene, is significant because it is when Jane Seymour’s character, Elise McKenna, meets Christopher Reeve’s character, Richard Collier, for the first time. Elise’s first words to Richard are “is it you?” as she gently touches the tree and Richard removes his hat. These are the exact same trees that were used during the filming of the movie. The juxtaposed photo below shows a side-by-side comparison to an actual screen shot from the movie. The costumes that you see were designed by Tracie Arnold of Past and Present Creations in Brandon, Florida and are nearly exact replicas of the costumes worn in the movie. 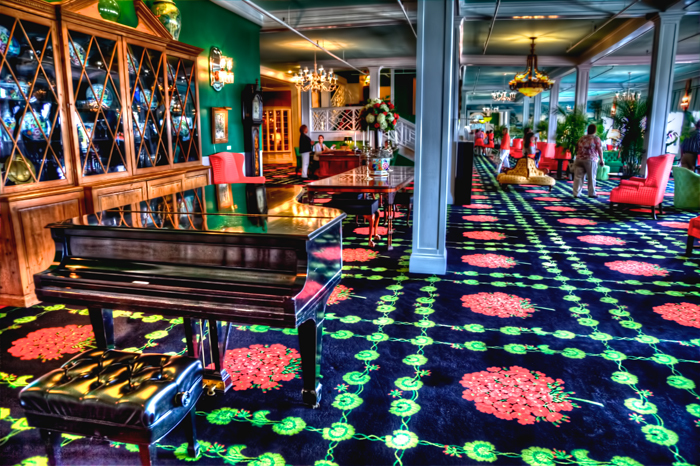 This photo was taken in October 2012 during Somewhere in Time Weekend 2012 at the Grand Hotel on Mackinac Island. This photo is special to me. That is me and my fiance Rose in the photograph. 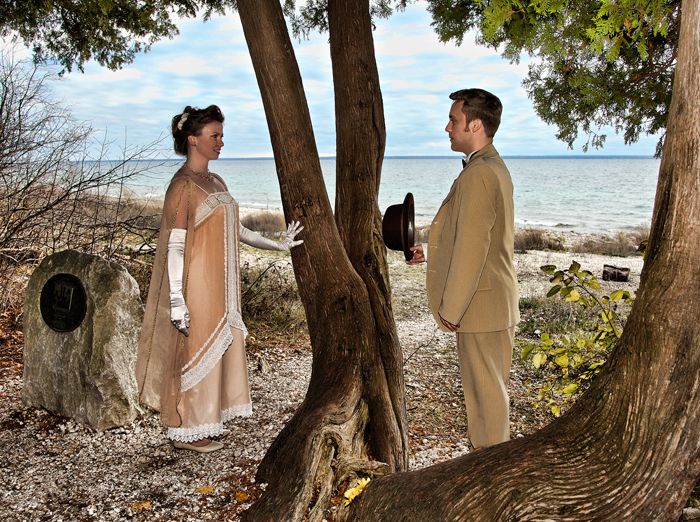 I surprised Rose with a trip to Mackinac Island and these custom made costumes and proposed to her the night before this photo was taken. View more of my photos from Mackinac Island, including photos of the Grand Hotel, fall photos, and more! Let me first start by saying that this photo is absolutely real. Nothing is superimposed. There is a reason that it has a ‘fantasy’ type of look to it. The above photo is an HDR photograph of the Las Vegas skyline taken from the 18th floor balcony of a hotel room in the West End tower of The Cosmopolitan Hotel and Casino near CityCenter and across Las Vegas Blvd from the Paris Hotel and Casino in Las Vegas. This photo was taken in November 2011 and features the Bellagio fountain, Paris Hotel and Casino, the Eiffel Tower at Paris, Bally’s Hotel and Casino, the Flamingo, Caesars Palace and the Bellagio. 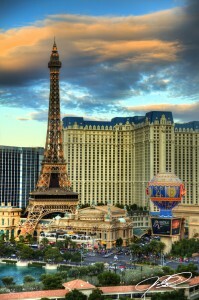 (LEFT) An HDR photo of the Eiffel Tower at Paris Hotel and Casino in Las Vegas. This photo was taken at the same time and as the above shot, on Saturday, November 12, 2011 (the same day as the much hyped third boxing match of Pacquiao vs Marquez across the street at the MGM Grand Arena). This photo was also taken from our balcony at the Cosmopolitan. The Eiffel Tower in Las Vegas is an exact replica of the real Eiffel Tower in Paris, only it has been scaled down to about half its size. Construction began on the Eiffel Tower along with the rest of Paris Las Vegas in 1997. It opened to the public along with the Paris Hotel and Casino in September 1999. At the top of the Eiffel Tower is the Eiffel Tower Restaurant, which features remarkable views of the Bellagio fountain show. I personally have not eaten there, but I have heard nothing but good things. The observatory at the top of the Eiffel Tower is a must-see destination for Las Vegas newbies! I recommend trying to go up about one hour after sunset, before it is completely dark outside. Check out more of my Las Vegas photos taken over the years! Las Vegas HDR by Joey B. Lax-Salinas is licensed under a Creative Commons Attribution-NonCommercial-NoDerivs 3.0 Unported License. 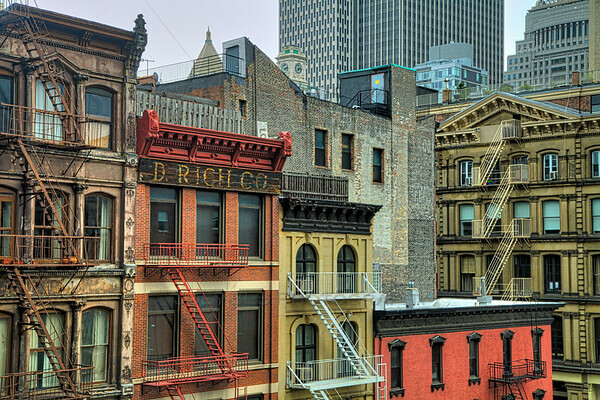 Permissions beyond the scope of this license may be available at http://www.joeyblsphotography.com.